Maggie Jones of Alska label with Emma Bentley from Canberra trying out the fashion at Bluesfest, 2015. BLUESFEST is renowned for bringing both a deluge of talented artists from around the world and a downpour of rain. And this year appears to be no different. The Bureau of meteorology is predicting continuing rain with a possible storm today and showers tomorrow, with the chance of a thunderstorm. Things are expected to clear on Monday with only a slight (20%) chance of showers in the evening. 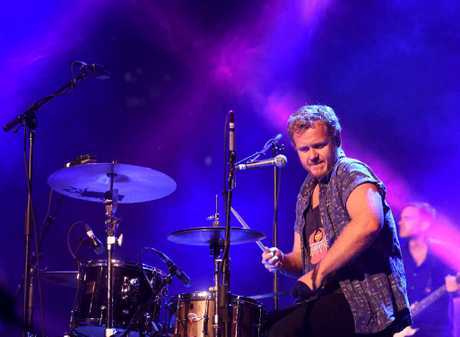 Boy and Bear member Tim Hart at Bluesfest 2015 on the Crossroads Stage. But it seems the damp and muddy conditions haven't hampered festival goers fashion sense. 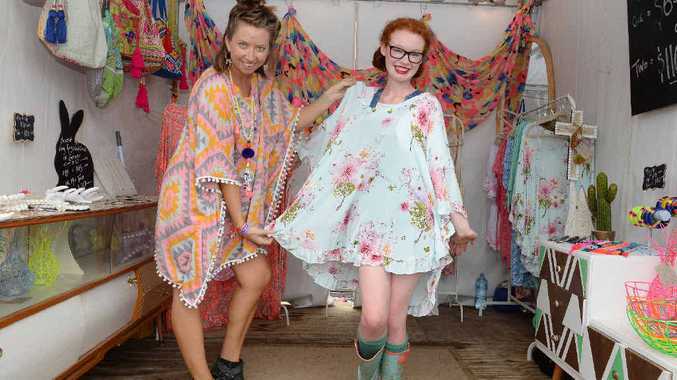 Owner of Bluesfest fashion stall Alska, Maggie Jones, said this year's festival fashion was all about bright and colourful patterns on light and breathable materials. "You can be and wear as creative as you like," she said. 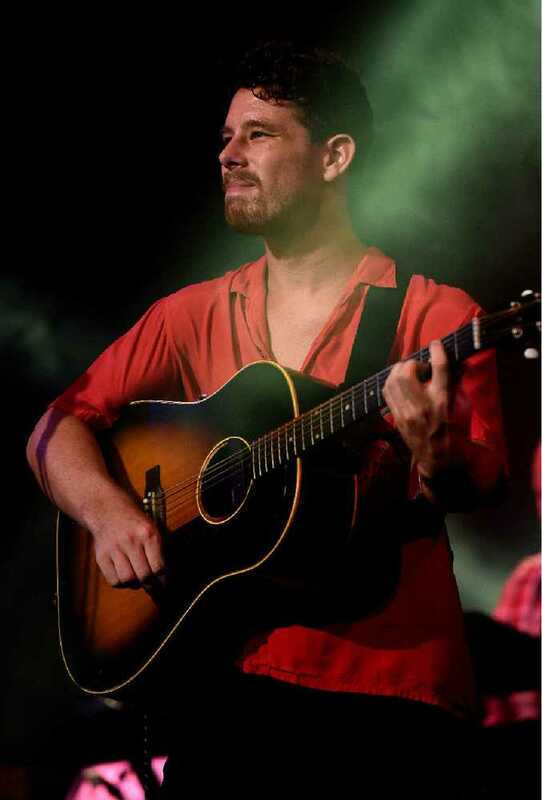 "That's the beauty of being able to come to this festival. "There's always a boho theme that runs through the festival… but I think this year it's colour, pastels, pom poms, kimonos and tassels." Ms Jones said the only real festival fashion no-no was stilettos. Festival goer and qualified stylist Joycelyn Nester said Bluesfest fashion was all about wearing clothes that are colourful, comfortable and cool. "This is the place you're free to wear what you want, not what you think you should wear," she said. 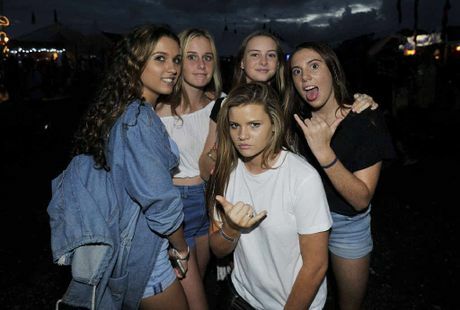 Elissa Scionti, Lily Sloman, Sian Fitzpatrick, Courtney Mundweil and Ava Cormack all of Byron Bay. "There's a lot of floral, bright colours, little jumpsuits, things that are easy to pull on and pull off in the morning." Ms Nester said festivals were an exception to footwear rules, where gumboots could go with anything. "No point in wearing cute and funky shoes when they're going to get saturated," she said. Summer Keller from Bluesfest fashion and jewellery stall Summer's Dreaming said crystal pendants were "big this year." 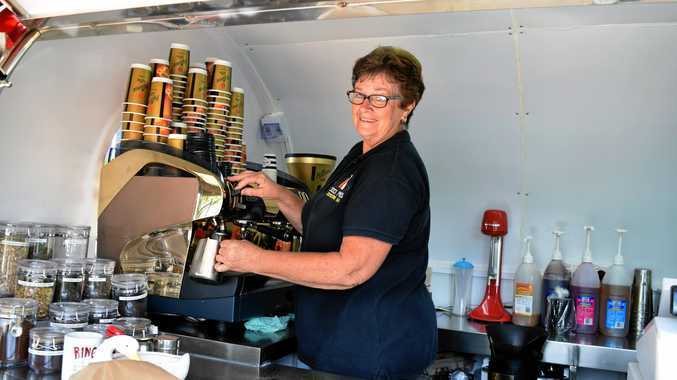 "The pendants have been popular since Bluesfest last year," she said. Ms Keller said chocker pendants and different coloured, personalised, pendants were selling particularly well. All the favourite festival fashion accessories including flower headpieces, shell necklaces and summer hats, are still as popular as ever. By far the biggest fashion accessory this year is the humble, yet practical, gumboot. Steer away from dull blacks and browns and find yourself a pair of bright, colourful and comfortable gumboots and a good poncho or raincoat. 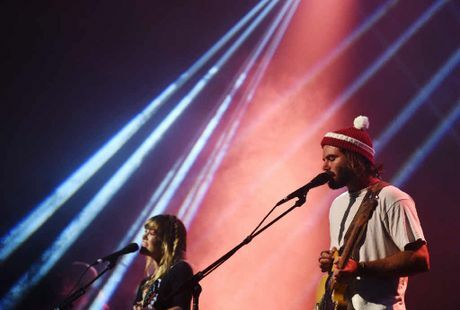 Angus and Julia Stone take centre stage.